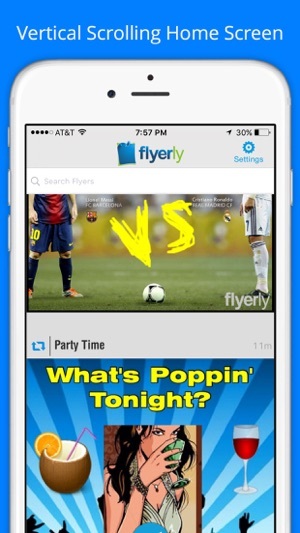 Flyerly gives everyone (not just creative folks) the ability to add creativity to your conversations. 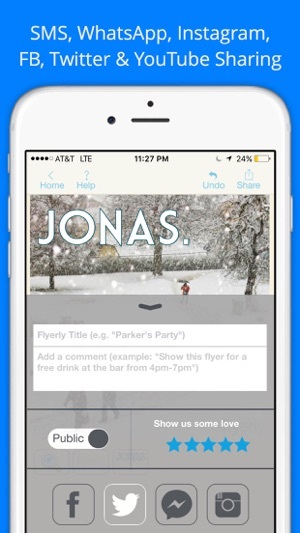 Think of a flyer as a creative form of digital communication that you can share with your friends, family, classmates, customers & more. 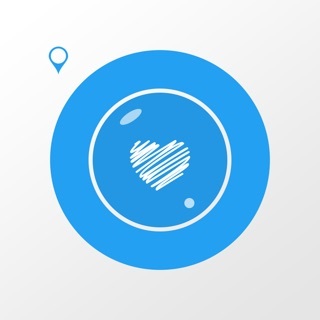 Tap the round 'Create' button to begin making a flyer for anything from promoting a business or service to telling a funny joke or inviting friends to a party. The creativity is limitless (sporting events, items for sale, special offers, concerts, Netflix & chill, lost pets, real estate/rentals, love letters, promotions, holidays). 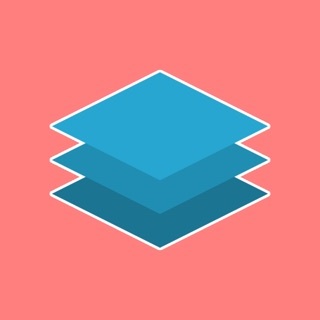 Select a background using Flyerly background options, take a realtime camera photo, use a video, select from Giphy library or your phone gallery and add a border to your background. Note: Video flyers are only available & part of Premium Features. 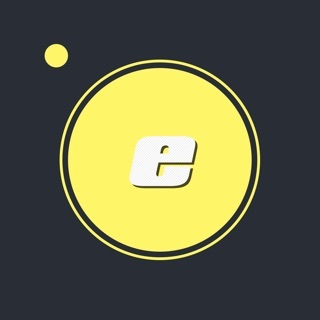 Add custom text, photos, art such as emoticons, symbols, drawing. Adjust color, size and border of custom elements. 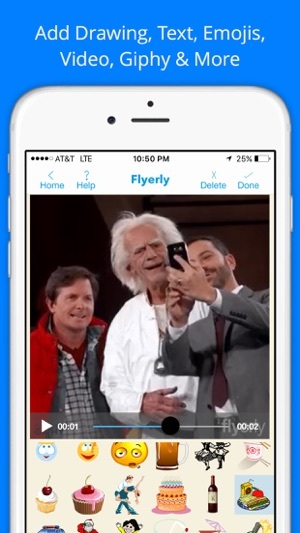 Every flyer you create will be saved into your 'Saved' area to return to later and share. Any flyer you send out will be stored in your 'Shared' flyers area. 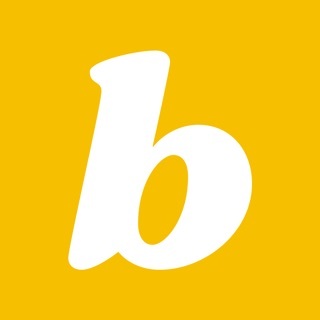 The 'Social' area will give you the pulse of flyers others are sharing on Instagram & Twitter. 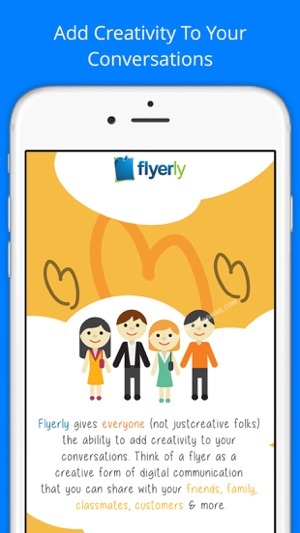 Remember to invite others to join Flyerly and make it more fun! 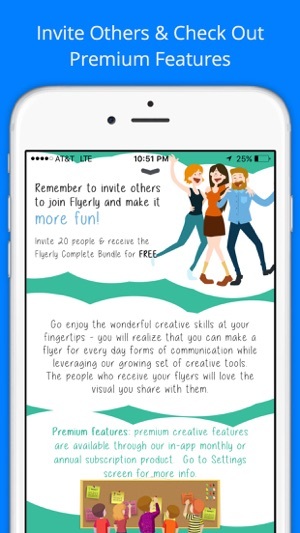 Go enjoy the wonderful creative skills at your fingertips -- you will realize that you can make a flyer for every day forms of communication while leveraging our growing set of creative tools. The people who receive your flyers will love the visual you share with them. - Complete Bundle or Video Flyers are available for one-time fee. 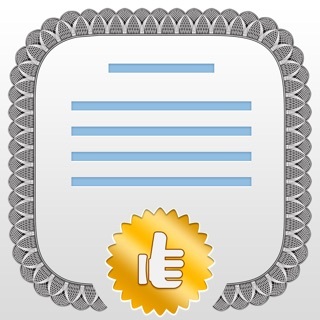 - Go to 'Premium Features' in the Settings screen for more info. - Printed postcards of your favorite Flyer for $2.00 per printed and mailed postcard (available in U.S. only). General. The Service is made available on a pay-as-you-go basis and is charged at the start of Your elected subscription term (generally monthly or annually). Auto renew. Your subscription will renew automatically based on Your plan’s renewal cycle. All subscriptions will automatically renew at the end of Your subscription period until cancelled by You. You will not receive further notice of auto-renewal. 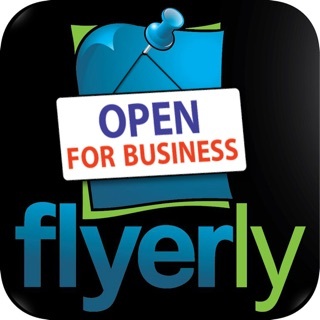 Be sure to follow us on Facebook (FlyerlyApp) and Twitter (@FlyerlyApp) for announcements, updates & new product launches. It is tricky at first . But once I started getting the hang of it .. I love it . I have a lot to learn yet . However there’s no doubt , It certainly has made my work and life easier . Surprisingly! 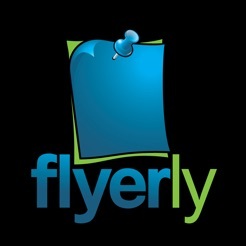 The Flyerly worked very well for me, I would use it again. Only thing I did not like, is that it has to accesse your contacts in order for you to use it. Other then that I'm satisfied. 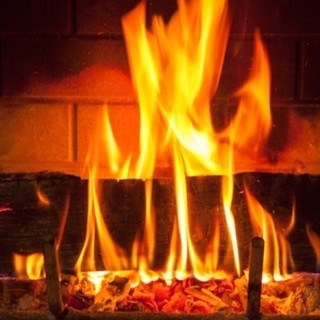 Great app and easy to use!